WOW, I am so excited to announce our next Guest, so without further ado, please read all about Cheree and follow her at Homemademoma you will be happy you found her blog! Thanks so much to Esmé for giving me this amazing opportunity to guest post for her, it took me forever to put this together for her. I love great recipes and happened to stumble upon her blog and just love it!! She is so generous to have so many guest posts on her blog. What I noticed first before all the amazing recipes are Share and Inspire Others!! It just got me so I had to read her about me. What an amazing blogger and wonderful person you are Esme. I am inspired!! 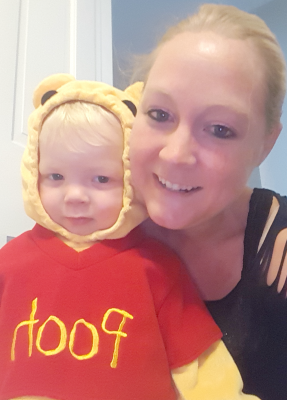 I work part-time doing food samples and the rest of the time I am a wife, homemaker, stay at home mommy to an almost 2-year-old and my 14-year-old who lives with my ex-husband. I love food and think it should always taste delicious, I am constantly taking pictures of everything that looks cool or artistic, and blogging every moment I get. I hope that I can be a help and encouragement to many mom’s and bloggers as I continue on this awesome blogging journey. Hoping to one day be a full-time blogger/stay at home mom and do what I love!! You have been working so hard writing posts every week, posting to Pinterest and joining Facebook groups and nothing seems to be working so you feel like you want to quit blogging. Everyone else around you seems to be doing great with their blog except you! 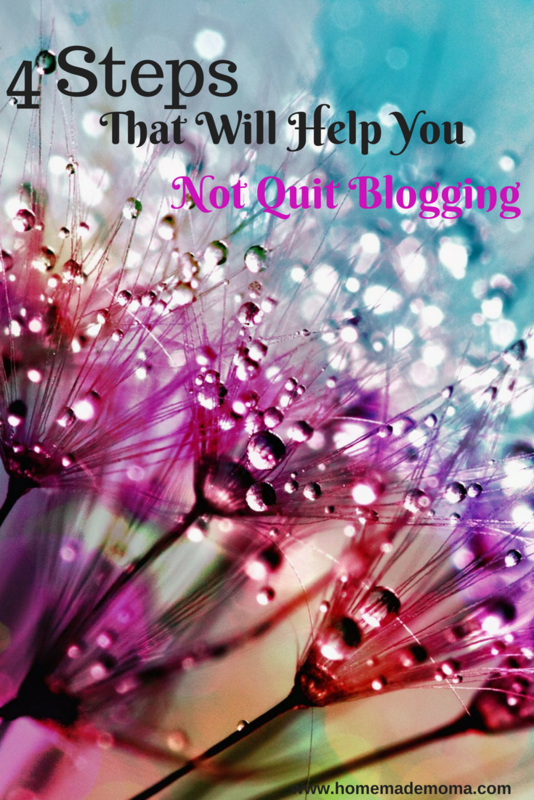 I can guarantee you that your not the only one that has wanted to quit blogging. If you were to ask top bloggers if they ever went through this I’m sure they would say yes. Some may have walked away for a while and came back. Please don’t quit blogging you can do this, you have a dream of being a blogger so don’t give it up just keep learning. The blogging road is tuff and a lot of hard work is involved, but please don’t quit now just push through the feelings and that negative voice in your head and keep going. I can tell you that this feeling is something I have been dealing with as well so I decided to write about it and encourage those of you that feel the same way. I almost gave up on it, but because of bloggers and posts like this and Sarah Titus (who inspired me to start a blog), I kept it going. You will never know where you will end up if you quit now so keep going, I know you can do this! Blogging should be something that is fun for you and if you only focus on the money side of it you aren’t going to go far. It should be a greater goal then the money, a bigger dream to help others by teaching them something or helping in some way. Implement these ideas and be consistent like I am and you will see results!! Look at what you are offering for a freebie, is it just a subscription to your posts or do you have an awesome product of yours or someone else’s to offer with an affiliate program? If you don’t have a freebie to offer you can go to Canva and make one, they have tons of templates and are super easy to use. Be creative look at what blogs you read and what makes you want to subscribe. A trick I started doing was to create a resource library that is password protected on your blog under the new page, then go to Canva and create some printables, calendars or whatever you think people would like when coming to your blog. Make sure it is something that goes with your niche. Next, go to your email service and create a landing page (I use Mailerlite they are free and easy to use) to create a funnel to drive traffic to your blog. Make the landing page your homepage so they have the option to subscribe to your list to get the password for your free resource library. Hard to pass up an option like that, who doesn’t want tons of free fun stuff!! I will have a tutorial on how to create these in another post so keep an eye out. A few days a week comment on other peoples blogs that you like, let them know you are reading their awesome content and love it. Who doesn’t love encouragement! Once a week contact a blogger and just talk to them try to create a relationship with other amazing bloggers because we are all in this together and are not competing with one another. The one thing I have found out about bloggers is how nice everyone is to one another and we all are very helpful. If you need help with something reach out to someone and ask, we all learn from one another so maybe the person you ask has struggled with the same problem or knows how to fix it. Every week find at least 10 boards to join. Yes, you won’t be accepted by every one of them but you will get at least two or three. This helps other people see your content and share it and you can meet more awesome bloggers as well. At least once per week, something that solves a problem for someone else in your niche of course. Do tons of research and have resources to back it up. This creates credibility and helps you get more traffic to your blog because they love your amazing content and want more. How did I figure all of this out, well one way was through research but the other is from two amazing bloggers that I follow. The key to following what other bloggers say is too narrow it down to two or three and stop taking other courses or reading about blogging anywhere else. Helps to focus on one or two things and try those first. Suzi Whitford from startamomblog.com has awesome courses to offer to help you blog better and some of them are free as well which is awesome! Eva Ron from happybloggingmom.com I found Eva on Suzi’s site reviewing her blog by number course and I have been talking to her ever since. She is awesome and always willing to help whenever you need it! Check out her blog here and read her helpful tips, this lady is amazing!! Look on Pinterest for resources as well depending on what you are looking for you will find it there. I like to do this when I have a specific how to question and I haven’t asked anyone. I look until I can’t find it when I go to Facebook group boards and ask. The key to making it as a blogger is consistency, always be consistent doing same things every week to help your blog grow and set down a strong foundation. Even if you only have an hour a day it all adds up and you are working towards your goal. It’s like the tortoise and the hare story from when we were kids “Slow and steady wins the race” others may be faster but they will probably burn out at some point and quit. The ones that make it are going to be working towards it every day for days and days never giving up just keep it going. Yes, you can make money blogging and yes it does work but you have to build that foundation and be patient none of this is a get rich scheme and if someone says they can make 2,000 the first month well maybe they can but most likely it’s a scam. Sometimes you have a post that goes viral all it takes is one that solves a big problem for people so I’m not saying it can’t happen but for most of us we won’t make money for a few months and when we do it will start out small. I hope you feel encouraged by this post, I really want you to succeed in blogging and not feel down about it. You can do this I know you can!!! Leave me a comment or question or email me if you like, I always love to hear from my readers! 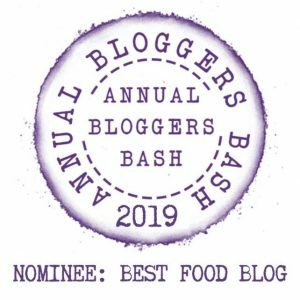 Hi Megala – Thanks for popping over – how about you also put together a Guest Post for us on your Traditional Indian cooking. Would you be interested??? Check out my About The Recipe Hunter and at the bottom you will find a contact form. You can use that to get in touch with me via email. Thanks in advance. Thanks so much, Esme ! I really feel honored to do a guest post in your amazing blog !! I will get in touch with you soon, thanks again for such a wonderful gesture ! Welcome Bernadette, I just love all the different Guest Posts and advise receive from our fellow bloggers. Do you have any Guest Post you wish to share with us. Check out my About The Recipe Hunter and at the bottom you will find a contact form. You can use that to get in touch with me via email. Thanks in advance. Very good advice all round particularly the taking time to interact. It is too easy to sit back and take the praise and forget that it is by giving that we ultimately reap rewards in abundance. For me the single top tip I would give go bloggers is to show that you care for all those that take the time to read your content. Thank you …. I enjoyed this! Well said – Yes interaction is the best and very important factor. Osyth, I have to take this opportunity to ask if you would be interest to share some of your stories with us. Check out my About The Recipe Hunter and at the bottom you will find a contact form. You can use that to get in touch with me via email. Thanks in advance. Perfect, that will be just fantastic – Just drop me that email when ready and then you’re set for a post here. Hectic Mom Jamie – I noticed you have a private site, I have requested permission to become a follower on your site and connect with you. Then the next step would be to know if you may be interested to share some of your stories with us and thus get to connect and know more followers. Check out my About The Recipe Hunter and at the bottom you will find a contact form. You can use that to get in touch with me via email. Thanks in advance. Hi there – Thanks for the link to your page. I will take a further look tonight once back home from work. I just tweeted your last post for you. Sharing is Caring. Hope to hear from you in due course. Awesome. Glad you can use her tips. Yea it has to be fun fun fun. Great tips! I want to create a resource library and you gave me some great ideas! Thank you! Whoop so glad you love and found benefit from this post. I loved reading this! I started my blog this summer beacaue I have a passion for helping others. I felt like there wasn’t a lot of resources out there when I was pregnant on staying in shape and how to get back postpartum. So I created my blog! I wanted to give up many time but I’m so glad I didn’t because now it’s taken off!! Glad you kept going. Please may I ask if you would be interested to share a post with us then more readets can see your posts. Let me know if interested. Great ideas, thanks!! Pinterest group boards are amazing!! Thanks for visiting. Glad you find the Guest post helpful. Would you also like to be a Guest? You are welcome! Aww thank you that is so sweet! It is such an honor to be a featured guest on your site. I am so glad that everyone that read this post got something positive out of it and hope they will feel encouraged as we begin this new year. Sharing and caring is what blogging is all about. Thanks Cheree – Whenever you wish to do another post, just drop me a note, as you are now familiar with it, and I will be happy to showcase more for you. Take care and thanks again.